I'm trying something new, and I need your help. Yes, you - with your iPhone in one hand and iPad in the other. You're just the kind of reader I'm looking for. I've entered a story in the Ether Books Halloween Contest. It's my first foray into publishing solely for mobile devices, in this case, exclusively for Apple devices (the Android version is coming soon). The rules are simple - whichever story is downloaded the most times before the end of the day on 31st October (next Wednesday, and - spookily - Halloween) wins the prize. The stories were all released together at lunchtime yesterday, and now the various authors have until Halloween to get the message out there and encourage people to download the free Ether Books app from iTunes, find the "Halloween Contest" in the genres section, and download our respective stories, again for free. 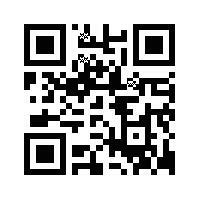 The QR code above should take you to the app. 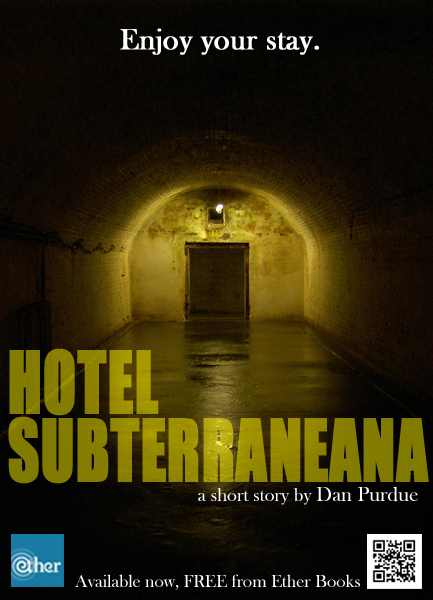 So, if you have an iPad, iPhone, or other Apple device that can download content from iTunes, please get yourself a copy of my story, Hotel Subterraneana. Thank you! It's been fun thinking up ways to promote this story, which is more in the Twilight Zone mould than about grisly gore or ghostly goings-on. Facebook and Twitter are the most accessible outlets, of course, and this blog, but it's hard to make sure the post gets noticed in the torrent of information that everybody is faced with everytime they log in to a social network these days. ... and I'm working out some other ideas that may or may not come to anything. It's interesting to play around with this kind of challenge. Find new ways to approach it, different angles to explore. The drawback is that with this being a competition where marketing skills and pester-power are more likely to result in success than plain old writing ability, it's difficult to know where to draw the line. I don't want to annoy anyone, but to do well in this contest I'll need to persuade lots of people to download my story in a relatively short time. It won't cost them anything, just a few moments of their time, but it's still awkward to have to prompt people to do it soon, not just when they get around to it in a couple of weeks. I'm lucky that I have people around me who are supportive and willing to help out, and I'm hugely grateful to them, but the likelihood is that I'll have to win over strangers as well, who may have no existing interest in my work and no real incentive to read one of my stories, regardless of whether it's free or not. So, please accept my apologies if I stray too far into mindless promobot territory, and if you can help by downloading my story, know that you'll have my undying gratitude. And by all means, let me know you've dived in and got yourself a copy - I'd love to hear what people think of it and I'm more than happy to owe a few favours by the end of the contest. Argh! Don't have the technology to cope with the word verification thing either. Just tried 4 times and I'm ready to give up. Sorry, I thought I'd deactivated the verification. I've tried again now, as I really don't want to discourage people from posting here. The Captcha things seem to be getting harder to decipher - the words are OK, but the numbers are such low resolution and so murky they are impossible. that's a great way to promote! we are so technically inclined, congrats on the story, too. good luck! new follower, here, hi!! I don’t have an iphone (or similar), so I’m not the kind of person you’re looking for. But… is that a picture from the Underground Hospital in Guernsey on your cover there, by any chance? Thanks, Tammy, great to meet you and welcome to the blog. I hope you enjoy it. Good call, Ric. I went there a few years ago and thought it was one of the eeriest places I've ever experienced. I thought the photo suited the story pretty well. I'd know those dank tunnels anywhere. Certainly one of the islands more, um, authentic (?) 'attractions'. Thanks, Rachel - that would be great! Good luck wrestling with the technology. To make up for not being able to download it myself I've mentioned it on my blog. Been trying for some time now to access your story on my Apple. I can get as far as finding your story but no way of opening. Accept I am neolithic IT person but this is irritating. Thank you for trying - I'm not sure what the problem is. If you've found the story and you're looking at the screen with my mugshot and the blurb for my story, it should just be a case of pressing the "Free" button to download. From memory this is blue and in the top right-hand corner. I hope that helps, but no worries if not - I appreciate the effort! not working for me either. after I attempt to download it is taking me back to al the other free stories. Sorry it didn't work for you - one of the other contestants said a friend in Ireland was having problems and the Ether people confirmed there was an issue. Something to do with currency transactions. Thank you very much for trying. I'll have a think about putting it up on here - it's quite I long story so I don't know how many people could face reading it onscreen.